As a frontline educational institution in scientific development and community engagement, Universitas Indonesia (UI) is required to play an active role in contributing not only to the state and people of Indonesia, but also to the world’s civilization and humanity. One form of contributions is conducting research, with results that can be dedicated to the people of Indonesia and the world. With the purpose of solving the nation’s and the world’s problems, which are urgent, and considering the history, capabilities and responsibilities of UI to make real contribution to maintain and improve civilization and humanity, a strategic move that is smart and dynamic for research activities and community engagement of UI becomes fundamental. The strategy is the determining a focus or niche of research that is based on the expertise possessed by the researchers of UI. UI, as a university that bears the name of the nation, is required to always be able to think about and help improving the lives and welfare of the people of Indonesia. Since its establishment, UI has carried out community engagement activities. The existence of a variety of devices and different fields of scientific expertise possessed by UI are expected to play a major role in a variety of real life activities as a form of implementation of science and technology to meet the needs of its own society. In accordance with the vision and mission of UI to be a world-class research university, UI needs to continue public service activities. A smart way to bring UI to the cutting edge of the development of science is to promote UI’s feature as a comprehensive higher education institution of higher education with almost all disciplines. 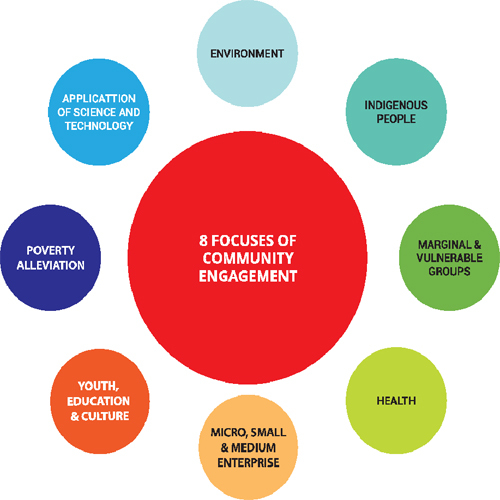 Therefore, the involvement of various community engagement volunteers and mono-discipline, oligo-discipline, and even inter­disciplinary groups is based on seven focuses of community engagement programs. To support the successful integration of community engagement programs at UI, a short-term program that can be organized is a community engagement-based collaboration at both national (with government institutions, private sector, NGOs, PT, etc.) and international levels (with NGOs, PT, etc.) by assessing the accuracy of the themes required by the nation and the world. In order to realize the community engagement activities that are interdisciplinary through collaboration among fields of studies, peer group, research centers, programs of study, strategic actions, such as concepts, policies and mechanisms, need to be prepared. regional and international levels in accordance with the competencies of the community engagement volunteers at UI. This method also opens the opportunity of creating 9 focuses of UI’s community engagement, namely: (1) Poverty Alleviation, (2) Environment, (3) Application of Science and Technology, (4) Marginal and Vulnerable Groups, (5) Indigenous People, (6) Youth, Education and Culture, (7) Health, (8) Community Empowerment and (9) Micro, Small and Medium Enterprise. The activities of community engagement implemented by the UI academic community are expected to be experienced by the public to increase the degree of life and welfare increase. Each Public Service activity conducted by UI academic community ought to meet the standard procedure using the facilities and infrastructure that meet the standards, complying with community engagement ideal foundation, and are based on the quality management of community engagement, which upholds professionalism, integrity, and transparency. UI academic community involves all parties in its community engagement. The Directorate of Research and community engagement of Universitas Indonesia (DRPM) UI, in this case Sub-directorate of Community Engagement is the implementing management unit assigned to facilitate and support the implementation of community engagement at UI. Sub-directorate of Community Engagement, therefore, considers it necessary to publish this profile book to improve the quality of community engagement activities and to expand its network of partnerships.